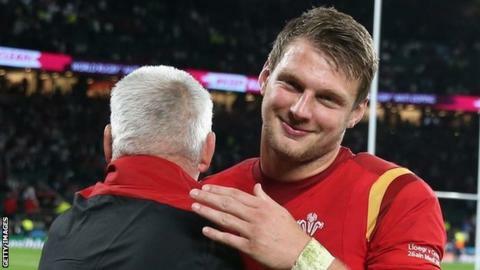 Dan Biggar, the hero of Wales' stunning World Cup win over England, can become the nation's greatest fly-half, says Lyn Jones. The Newport Gwent Dragons boss coached the 25-year-old as he made his way up through Ospreys' ranks. Biggar's man-of-the-match display at Twickenham saw him kick 23 points, including a long-range winning penalty. "If he carries on like this he's going to be the best ever number 10 Wales have ever had," said Jones. To become accepted as the top fly-half in Welsh rugby history, fans would have to be persuaded Biggar will be able to overhaul legendary stand-offs Barry John, Phil Bennett, Jonathan Davies, Cliff Morgan and Dai Watkins. John preceded Bennett in the position during a 1970s golden era in which Wales dominated the Five Nations Championship. Both also starred as the British and Irish Lions won historic Test series - John with the 1971 Lions in New Zealand and Bennett as their pivot on their 'invincible' 1974 tour to South Africa. John had himself succeeded dual-code legend Watkins while Morgan was similarly lauded during the 1950s. Watkins and Morgan also played for the Lions, a feat Davies did not achieve as he moved to rugby league before their successful 1989 tour to Australia. Biggar is likely to have Ireland's Johnny Sexton and England's Owen Farrell as rivals to tour New Zealand with the Lions in 2017. Former Wales open-side flanker Jones said Biggar was "outstanding" throughout their dramatic win at Twickenham. Biggar ended the game at full-back following a reshuffle forced by injuries that prompted Rhys Priestland's introduction at stand-off. Jones added that Biggar provided "probably the best [Welsh] outside-half display we've seen for many a year". And with regular goal-kicker Leigh Halfpenny absent after being ruled out by injury before the tournament, Jones says Biggar had the chance to underline his prowess. "His goal-kicking for me is 10% better than Leigh Halfpenny's - that's only a statistic, they don't lie, unfortunately," said Jones. "And there's been some discussion that 'we can't play without Leigh' because of his goal-kicking. "Dan Biggar's a far better goal-kicker." Wales face Fiji on Thursday hoping to take another step towards the World Cup quarter-finals after the wins over England and Uruguay. Warren Gatland's side play their final Pool A match on Saturday, 10 October, against Australia at Twickenham.